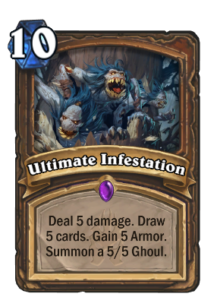 Ultimate Infestation is an Epic Druid class card from Hearthstone’s Knights of the Frozen Throne expansion. It is a ten-mana spell that deals five damage, draws five cards, gives you five armor, and summons a 5/5 minion. It has been an incredible addition to many Druid decks: with such powerful swing and card draw available on demand, it is often possible to use Nourish for ramp and go for an Ultimate Infestation for a refill as early as Turn five or six. The amount of tempo generated by such plays is almost unbeatable. It also has its poor moments, especially in those games where you do not find enough ramp and are generally stuck with a lot of cards in hand for several turns, unable to make good use of the five-card refill. Nonetheless, that’s but a minor inconvenience, and even burning some cards can be alright: despite the ten-mana cost, you can often play more cards on the same turn thanks to the power of Innervate, so even drawing your hand full does not mean that it stays full until the end of the turn. I have played plenty of N’Zoth Control Warrior this season, and have been able to win a lot against Jade Druid even without Skulking Geist to prevent them from going infinite with Jade Idols. Why is this possible? Ultimate Infestation is the key. When it comes to specific end-game situations, Ultimate Infestation does not allow for similar levels of card draw and tempo gain as Gadgetzan Auctioneer. With Gadgetzan Auctioneer, you are drawing a bunch of cards while developing multiple large Jade Golems on the same turn. With Ultimate Infestation, the only way to develop Jade Golems on the same turn is to have an Innervate and Jade Idols in hand. This opens up a window of opportunity for decks such as N’Zoth Control Warrior to get a swing turn while the Druid is refilling, and also to potentially get the Druid to a position where they can only draw one Jade Idol each turn in the late game. Is this even an issue? It is only an issue against very specific types of decks: control decks that are able to play a powerful swing turn. N’Zoth decks are the prime example, and some Demon-heavy Control Warlock could perhaps also take advantage of the same weakness, although simply teching in a Skulking Geist could also prove to be powerful enough. Kun the Forgotten King. 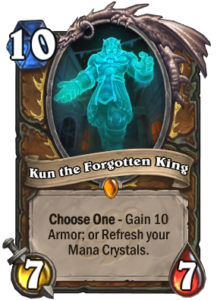 Kun can give you back all of your mana crystals, so you can effectively play it for free at ten mana. This gives you a board of a 7/7 and a 5/5 on your Ultimate Infestation turn. Arcane Giants. After playing enough spells, Arcane Giants cost zero. 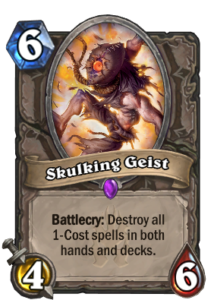 As Jade Druid decks have a lot of spells, they will reach that zero cost in the late game. Dropping two 8/8 minions alongside Ultimate Infestation is a powerful tempo play. Gadgetzan Auctioneer. While there is not enough room in the deck to run two copies of both Ultimate Infestation and Gadgetzan Auctioneer, it is possible to include one Auctioneer in the list. This enables powerful tempo plays in the late game via an alternative method to Ultimate Infestation. All three solutions provide at least some reprieve. 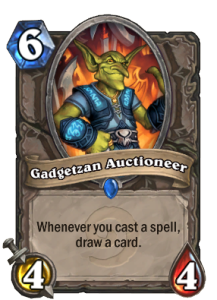 Kun is the weakest swing of the three and Gadgetzan Auctioneer is the strongest, but only if you have Jade Idols left. If you are facing a Skulking Geist instead, going infinite with Jade Idols is not an option. For such a scenario, it is Arcane Giants that give you the most threats possible to try not to run out of threats before the opponent runs out of answers. Previous Previous post: Knights of the Frozen Throne: King Mosh is finally good!